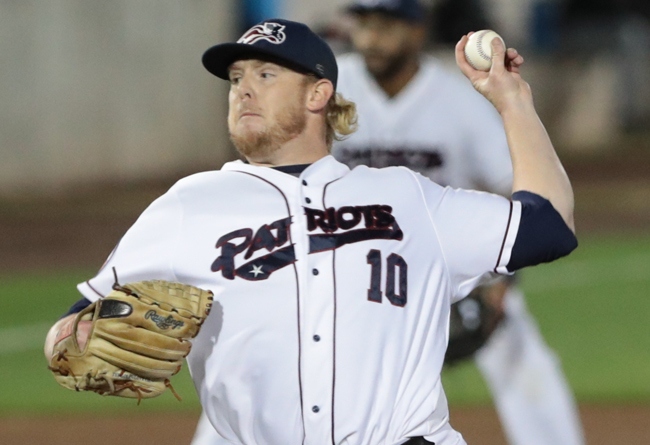 (Bridgewater, N.J., Jan. 14, 2019) - The Somerset Patriots have re-signed left-handed pitcher and 2018 Atlantic League Post-Season All-Star Mike Antonini for the 2019 season. Antonini enters his third season with the Somerset Patriots and fifth in the Atlantic League. The southpaw reliever impressed with a 1.61 ERA over nine starts with the Patriots in 2017, but built upon those numbers out of the bullpen in 2018. He went 3-2 with a 1.41 ERA over 42 relief appearances, including a 56/11 strikeout-to-walk (K/BB) ratio over 51 innings of work. Antonini went 2-1 with a 1.62 ERA over nine starts in his first go-around in Somerset back in 2017. The lefty struck out 47 batters against just 10 walks over his 39 innings pitched that year, including a career-best 10.8 K/9 ratio. He did not allow more than two runs or five hits in any of his nine regular season starts in 2017, including a 10-strikeout performance over five shutout, one-hit innings on August 13th against the Lancaster Barnstormers. His lone loss – which came in his next start on August 19th at Southern Maryland – occurred after he tossed six innings of a seven-inning game without allowing a hit. Antonini appeared in 13 games with the Camden Riversharks in 2013 before he pitched for the Bridgeport Bluefish in 2015 and 2016. His previous best Atlantic League season came in 2015 with the Bluefish when he posted four wins over 11 starts with a 2.79 ERA and 62 strikeouts in 67.2 innings of work. The Georgia College and State University alumnus also enjoyed a solid season for the New Jersey Jackals (Can-Am) in 2014 with a 9-3 record, 2.84 ERA and 115 strikeouts in 117.1 innings pitched. That included a Can-Am record 15-strikeout performance on July 12th, 2014 against the Lincoln Saltdogs. Antonini spent the first four years of his professional career in the New York Mets organization, and reached the Triple-A level in both 2009 and 2010. He was then traded to the Los Angeles Dodgers and was named a 2011 MiLB.com Organizational All-Star with Double-A Chattanooga. He appeared in 30 games with Triple-A Albuquerque in 2012 and was twice called up to the Majors, but never appeared in a game. The 2007 18th-round draft pick is 62-65 in his 11-year professional career with a 4.00 ERA.